Light curves of 21 Com. The panels illustrate, from top to bottom, the full MOST light curve, a zoomed-in view of a 10-day segment of the MOST light curve, and the full APT light curve, respectively. Obvious outliers were removed from MOST data by visual inspection. The dashed line in the upper panel indicates HJD 2457844.8635, from which date onwards 21 Com was observed exclusively and the cadence consequently increased to near-continuous coverage. The long-term trend seen in the APT measurements is due to beating of the 2-d rotation period and the nightly sampling of the data. Credit: Paunzen et al., 2019. 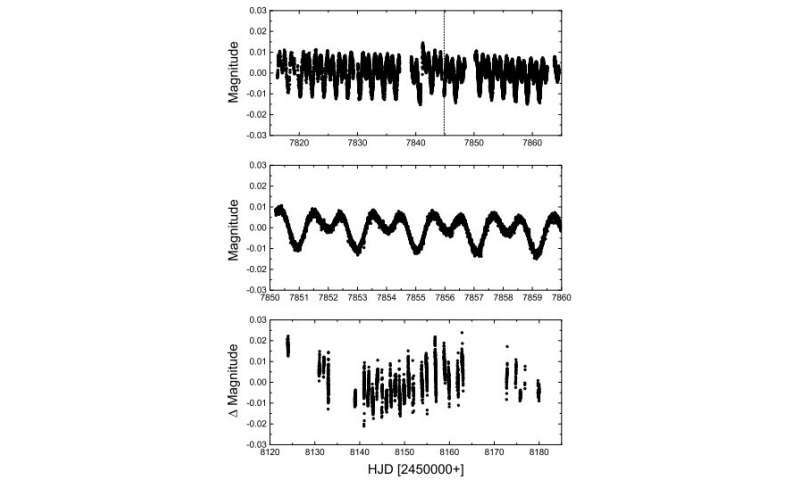 Astronomers have employed the Microvariability and Oscillations of Stars (MOST) space telescope to conduct a new investigation of the enigmatic variable star 21 Comae whose nature is still widely debated. Results of the new study, presented in a paper published April 9, could help us better understand this mysterious object. 21 Comae, or 21 Com for short (other designations are HD 108945, HR 4766 and UU Com) is a magnetic, chemically peculiar (Ap/CP2) star of spectral type A3pSrCr detected about a century ago. The star is a member of the Melotte 111 open cluster located some 280 light years from the Earth. Since 1953, astronomers have studied 21 Com extensively, which eventually led to the detection of its magnetic field and the star's variability. In particular, the object was found to exhibit an α2 Canum Venaticorum (ACV) type variability, while some studies even suggested the existence of short-term variability with periods typical for δ Scuti and roAp star pulsations. However, the discrepancy in the available data regarding 21 Com's variability, its rotational period and other properties, leave the star's true nature shrouded in mystery. Those uncertainties led astronomers to conduct further observations of this object. So an international group of astronomers led by Ernst Paunzen of Masaryk University in Brno, Czech Republic, decided to reinvestigate 21 Com using MOST, Canada's first space telescope. Their observational campaign, complemented by data from ground-based observatories, was focused mainly on determining if it indeed showcases all the suggested three types of variability, what would be a combination not known for any other star. "We have performed a new investigation of 21 Com using MOST satellite and high-cadence ground-based photometry, time series spectroscopy, and evolutionary and pulsational modeling," the astronomers wrote in the paper. The study found that 21 Com shows increased abundances of, in particular, the iron-peak elements, such as chromium (Cr), and strontium (Sr), while light elements like carbon (C) and oxygen (O) are slightly underabundant. This chemical analysis allowed the researchers to conclude that 21 Com is indeed a CP2 object. The results suggest that 21 Com is a main-sequence star seen equator-on about 2.6 times larger in size than our sun and with a mass of about 2.29 solar masses. The effective temperature of the star was calculated to be approximately 8,900 K.
Furthermore, although the research confirmed the existence of rotational modulation on a period of around 2.05 days with an amplitude of 19 mmag, the astronomers have not detected any additional variability on short-time scales. This, according to the authors of the paper, most likely indicates that 21 Com is a classical CP2 star exhibiting only rotational ACV variability. "While it is impossible to assess whether 21 Com has exhibited short-term variability in the past, the new observational data and several issues/inconsistencies identified in previous studies strongly suggest that 21 Com is neither a δ Scuti nor a roAp pulsator but a "well-behaved" CP2 star exhibiting its trademark rotational variability," the researchers concluded.